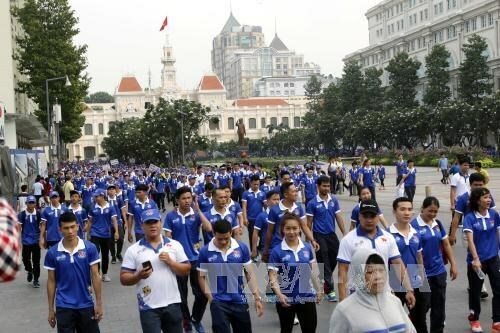 HCM City (VNA) – Over 5,000 people joined a walk along Nguyen Hue Street, downtown HCM City, on August 6, delivering their support for the Vietnamese team who will depart for the 29th Southeast Asian Games in Malaysia this weekend. The event was co-held by the Vietnam Olympics Committee and the municipal Department of Culture and Sports. The city’s senior officials and the athlete team of the south also offered flowers at the monument of late President Ho Chi Minh. Speaking at the event, Deputy Director of the General Department of Sports Tran Duc Phan said the Vietnamese team to the 29 SEA Games comprises 681 members, including 476 athletes who will compete in 32 out of 38 sports at the games. Vietnam aims to finish in top 3 with over 60 gold medals, said Phan who will lead the team in Malaysia, adding that the squad is ready to do their best. At the previous Games, Vietnam ranked third with 73 golds, 53 silvers and 60 bronze. About 200 athletes of the southern team will join the national delegation in the region’s biggest sports event, competing in 14 sports. They hope to bring home 10-12 gold medals, particularly in sports of their strengths like track and field, swimming, and aerobics.